Flip it over and see what is stamped on it. It's from an ad and I was trying to get a quick reply before I contact the seller. They look like they would be Volvo OEM, but I don't see them in a Google Volvo wheel search. Thus, I'd bet aftermarket. Let us know if you find out please. I'm betting aftermarket. Never seen them before. 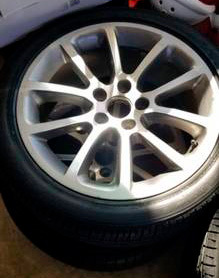 Seller has them listed as wheels that came off a Volvo and at a great price. To make a long story short those are Ford Fusion wheels. Thanks for your input.